chanting priests, and spectacular mountain scenery. green, with warm friendly people and wonderfully diverse and plentiful food. 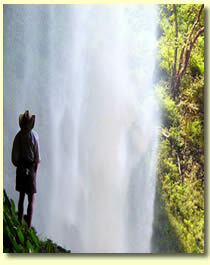 most notably the Blue Nile, Omo, Tekeze, and Awash. are otherwise impossible to visit. More than just a river trip, a float with Nile River Safaris will take you to another place, another era, where the wildlife and cultural groups carry on as they have for thousands of years. 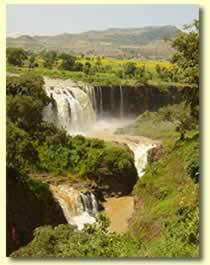 Welcome to the Blue Nile River - Ethiopia's Undiscovered Gem! The Nile River begins its journey to the Mediterranean Sea near the picturesque town of Bahir Dar on the shores of Lake Tana, our base of operations. In Ethiopia the Blue Nile is known as “Abay Wenz” and offers a wealth of opportunities for both the casual and adventurous traveler. Featured in the recently released IMAX / OBITAMAX film "Mystery of the Nile", the section of the river between Lake Tana and Blue Nile Falls has it all: wonderful scenery and picturesque villages with superb birding and wildlife. Whether your looking for fish eagles or hippos, traditional Ahmaric crafts or spicy Ethiopian fare, lazy days in the sun or thundering whitewater, you will find it all with us on Ethiopia's Blue Nile River. 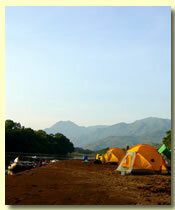 Our tours range from scenic half-day calm water floats to two week multi-activity adventure packages. Our scenic floats begin just below Lake Tana, the source of the Nile, and travel through a typical highland farming area with superb birding and a friendly pod of hippo. 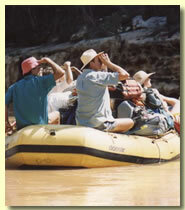 On our one day and multi-day whitewater trips you'll experience some of the most exciting rafting in Africa, with options ranging from class III to class V.
When you join one of our package tours leave everything to us. We'll pick you up at the airport and along with the Blue Nile invite you to share a variety of the many of the wonders of Ethiopia. Ethiopia is a welcoming and diverse country and we invite you to come see for yourself why it’s quickly becoming known throughout the world as a safe and friendly destination. We hope you enjoy our website and invite you to click on the contact page where you can reach us with any questions you might have. We look forward to helping you experience the best of Ethiopia.